Local elected officials on the SLO County Air Pollution Control District (APCD) board of directors clashed on March 28 over the reappointment of a district hearing board member—the hearing board is in the middle of litigating a APCD nuisance abatement case that aims to curb Oceano Dunes State Vehicular Recreational Area dust emissions. ANOTHER DUNES SPAT The SLO County APCD squabbled over the reappointment of former APCD officer Robert Carr to its hearing board on March 28. 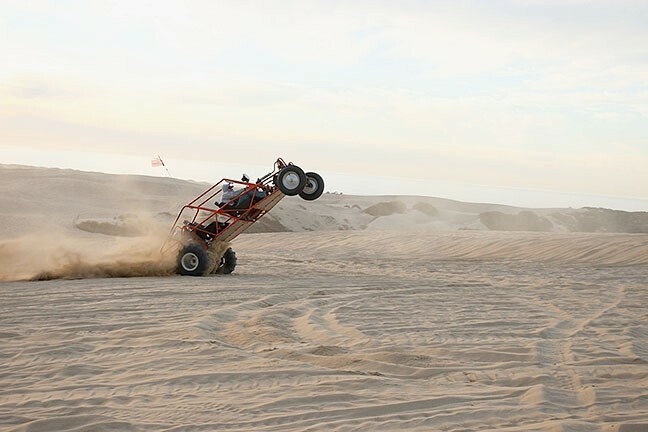 The hearing board is overseeing a nuisance abatement case against the Oceano Dunes State Vehicular Recreation Area. After first voting to deny Robert Carr, a former APCD officer, of a reappointment to the hearing board, Pismo Beach Mayor Ed Waage and Paso Robles City Councilman John Hamon reconsidered and narrowly reversed the decision by a 7-4 vote. "I understand the need for continuity [on the hearing board]," Waage said about his change of position. A "quasi-judicial" body, the APCD hearing board "decides on matters of conflict between the Air District and industry," according to the APCD's website. It has five members, including an attorney, an engineer, a medical professional, and two public members. Carr has been a public representative on the board since 2006. In November, the APCD filed a nuisance abatement petition to the hearing board, declaring the dust emissions from the off-road vehicular park a danger to public health. In March, the hearing board rejected a proposed settlement between the APCD and State Parks to reduce dust emissions by 30 percent, calling it not restrictive enough. At the APCD board of directors' March 28 meeting, where Carr's reappointment was up for consideration, several of the board members who have historically opposed the APCD's push to challenge State Parks on the dust problem took issue with Carr's position not being advertised to the public. APCD policies only require a hearing board vacancy to be posted if an incumbent member resigns or isn't reappointed. "I can't vote for an appointment on a position that was never opened to the public," said 5th District SLO County Supervisor Debbie Arnold. "It has to do with transparency." Waage, Hamon, 4th District County Supervisor Lynn Compton, Atascadero City Councilwoman Roberta Fonzi, and Arroyo Grande City Councilwoman Barbara Harmon concurred. Harmon said she felt Carr was "biased" in favor of the APCD. "I only learned at the APCD hearing that Mr. Carr spent his entire career as the APCD officer of SLO County," Harmon wrote in an email to New Times. "He is now on the hearing board deciding the merits of a notice of abatement filed by the former APCD officer [Larry Allen] and the agency from which he draws his retirement. In my opinion, he is biased and should have recused himself." After the 6-5 vote denying the reappointment—which would've resulted in the hearing board continuing the case with four members—2nd District County Supervisor Bruce Gibson implored the board to reconsider its decision. "This is an outrageous result," Gibson said. "What this board has done is undermine the very substance of what the hearing board is in place to do." John Headding, a Morro Bay City Council member, voted to support the reappointment and said he felt using it to criticize the APCD's policies on advertising vacancies was inappropriate. "We have an existing process that is in place, and I believe the current board should adhere to that process," Headding said. "If they're concerned about issues regarding the process, that should be agendized for a future item and then the policy can be changed." Carr told New Times that the squabble over his reappointment and claims about a bias surprised him.